Sometimes less alcohol goes a long way. Imagine sitting by the pool or enjoying a spring picnic with some cool white wine in the GoVino or plastic wine glass. Less alcohol will allow you to enjoy this scene a bit longer — lingering over tasty snacks or ogling the people at the pool. Kinda dreamy, huh? Brancott Estates, known for their New Zealand Sauvignon Blancs, has launched a new line of wines called Flight Song, pimping them as having 20% less calories (than their other wines). And lower alcohol. About 4% less alcohol actually, weighing in a 9%. This is a tale of three wine stories — an up-and-coming California wine appellation, a growing business model in the wine biz, and an under-appreciated-yet-slowly-gaining-a-rep grape, Chenin Blanc. This wine review highlights all three in one, 5-minute post. Who says service is dead? The Clarksburg appellation in northeast California enfolds 59,000 acres of warm-climate land, encompassing Sacramento and bordering on the Sacramento River. About 10,000 acres of heat-loving grapevines are planted here but it’s not particularly recognized as an appellation. This is mostly because the majority of the fruit is sent outside the area for crushing not to mention the best grapes grown here remain a mystery to the majority of wine drinkers — Chenin Blanc and Petite Sirah. Clarksburg Wine Company hopes to change that. Naming their wine label after an unknown region borders on ballsy but they’re also exploring a relatively new business model — “custom crush”. Imagine calling up a winemaker and asking them to make a wine specifically to your tastes? “I’d like it to taste slightly sweet but not syrupy; high acid yet full-bodied”… that’s what custom crush companies do for you (as well as commercial entities). 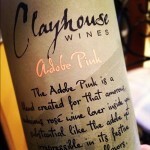 So, in addition to making wine under the Clarksburg Wine Company label they also make wine for others. Something for everyone, you might say. One the juiciest parts of blind-tasting wines is the shock and awe when you uncover a really, really tasty find. It’s like unearthing a lost twenty in your jacket pocket or getting something on sale that you needed anyway. A delicious surprise. I hadn’t tried Pepi wines for many years, finding them rather boring and uninspiring in days past. But this fruity little Chenin-Viognier number caught the eye of every taster at the group tasting table. From the wine pro to the casual consumer, virtually everyone gushed, anxiously awaiting the “reveal” to find out the price. So they could go buy a case. They got their wish… Pepi Chenin Blanc-Viognier is quite affordable at $10. I hadn’t tried Pepi wines for many years, finding them rather boring and uninspiring in days past. But this fruity little Chenin-Viognier number caught the eye of every taster at the group tasting table. From wine professionals to casual consumers, virtually everyone gushed, anxiously awaiting the “reveal” to find out the price. So they could go buy a case. They got their wish… Pepi Chenin Blanc-Viognier is quite affordable. The 2011 Pinot Gris from Oregon’s Willamette Valley are simply spectacular. Loaded with tart acidity, peaches and grapefruit, you can be assured that any bottle of 2011 Oregon Pinot Gris you grab from the shelves will be worthy of passing your lips. But if you can find this one, you’re golden. The Elk Cove 2011 Pinot Gris has refreshingly crisp acids, resulting from the cooler climate experienced throughout the state during that vintage year. Fragrant citrus fruit on the nose leads into a light-bodied white with flavors of pink grapefruit (but smoother than a New Zealand Sauv Blanc), lime zest and green apples. This grog is sassy and simply easy to drink on a warm day. I admire when a winery steps outside the annoying conservative boundaries of the wine industry. Randall Grahm of Bonny Doon fame (an interview with him), The Three Thieves and their ground-breaking Bandit wine in a small box and chalk up another win to the folks at Oregon’s King Estate (reviews of their other wines), who created this Washington State-based project, North by Northwest. These guys have the chutzpah to do things differently. Barbera is an unfortunately overlooked red grape/wine from the Piedmont region of Italy. But it’s SO tasty. Plenty of fruit but also high acidity, making it a quintessential food pairing experience. You’ll find Barberas from the Asti sub region, which often have often a more feminine style (due to the soil structure in that region) and the Alba sub region, producing the yin, masculine version. Barberas from Asti, as a general rule, appeal more to my taste. And this Asti from Vietti kinda rocked my world.